High-level moles are the bane of every intelligence agency. There is still a reason to believe that the American spy for Israel, Jonathan Pollard, reported to a higher-level Israeli intelligence mole within the Reagan administration. Britain’s MI-5 Security Service remains plagued to this day over evidence that its Cold War-era director, Roger Hollis, was the “Fifth Man” in the “Cambridge Five” Soviet spy ring. In 2014, Flynn was fired as director of the Defense Intelligence Agency (DIA) by President Obama. Obama was advised by Brennan to dump Flynn because the DIA director was producing intelligence policy documents showing that it was a mistake and against U.S. security interests to support Syrian jihadists who were trying to topple Syrian President Bashar al-Assad. For Brennan’s Saudi and Wahhabist controllers, this was tantamount to blasphemy. Brennan blindsided the American people by claiming the Syrian rebel forces were “moderates.” Flynn countered Brennan in DIA intelligence reports by documenting how the majority of Syrian rebels were radical Islamists supported financially and militarily by Saudi Arabia and Qatar. Moreover, Flynn maintained that “Turkey was looking the other way when it came to the growth of the Islamic State inside Syria.” Brennan was furious at his fellow Irish Catholic’s view of Syria and the Middle East. The Saudis had carefully groomed Brennan ever since his days as CIA station chief in Riyadh in the mid-1990s. The Saudi King, as “Custodian of the Two Holy Shrines of Mecca and Medina,” arranged for Brennan, a convert to Wahhabi Islam while running the CIA’s Saudi station, to perform the “hajj” pilgrimage to Mecca. Only observant Muslims are permitted to visit the Al Kaaba Al Musharrafah (The Holy Kaaba) in Mecca. In March 2013, just prior to Brennan’s being confirmed by the U.S. Senate, former FBI agent John Guandolo confirmed that Brennan had indeed converted to Islam while he was the CIA chief in Riyadh. Brennan had previously served as Obama’s counter-terrorism adviser on the National Security Council. He was also in charge of the cleansing of the Obama/Dunham family passport files at the State Department in 2008 while CEO of The Analysis Corporation, a CIA contractor. It was Brennan who helped cover up the Saudi government’s role in the Khobar Towers bombing in 1996, which killed 19 U.S. servicemen. As chief FBI investigator of the bombing, John O. Neill came across hard intelligence linking the Khobar bombings to the Saudi government. While not the only reason, it was a significant reason for Brennan to set O’Neill up in a briefcase theft caper before his retirement in 2001. O’Neill had just taken the job as head of security for the World Trade Center when the terrorist plot involving Saudi Arabia brought the towers down on September 11, 2001. O’Neill was killed in the collapse. Brennan fought strenuously against the release of the 28 classified pages from the Congressional Joint Inquiry into Intelligence Community Activities Before and After the Terrorist Attacks of September 11, 2001. Although finally released with redactions and Brennan’s acquiescence, the 28 pages, although highly suggestive of Saudi government involvement, could not be used as prima facie evidence to implicate the House of Saud. There is no reason to believe that what was released constituted the original text contained in the 28 pages. Brennan had every reason to tamper with the original pages in order to protect the Saudis, and by extension, himself. As CIA director, Brennan would possess most of the keys to the U.S. intelligence kingdom. 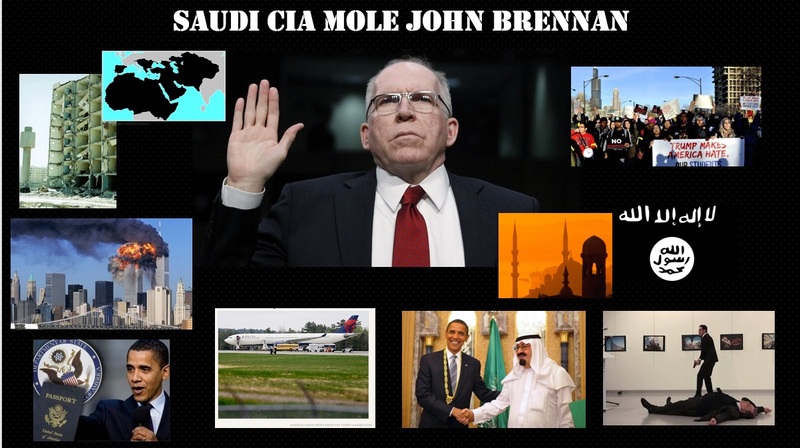 And Brennan’s kingdom would make America’s most closely guarded secrets available to the Kingdom of Saudi Arabia, the world’s chief supporter of Islamic jihadist terrorist networks, including the Islamic State, Al Qaeda, Boko Haram, and numerous others. To placate his Saudi masters, the Jesuit-educated Brennan opted to take the oath of office as CIA director on a copy of the secular U.S. Constitution, not on the Bible, as every past CIA director, Christian and Jewish, had done. One of Brennan’s first acts as CIA director was to ban the term “jihadist” to describe Islamist terrorists, preferring instead the word “extremist.” As a Wahhabi Muslim, Brennan understood that “jihad” is a term used in the Koran compelling observant Muslims to maintain and spread what they consider to be the one true faith in Allah (God). For Brennan to use the term “jihad” in a negative or pejorative sense would constitute “haram” or a “forbidden act,” according to the Muslim Koran and Sunnah religious texts. Brennan stated that any suggestion that the U.S. was at war with the religion of Islam was an affront to the faith, a comment spoken as a true Wahhabist believer. Brennan worked his way up the ladder at the CIA after his conversion to Islam. In 1999, Brennan was appointed chief of staff to CIA director George Tenet. In March 2001, as final implementation plans were being laid to carry out the 9/11 attacks, Brennan became deputy executive director of the CIA. After 9/11, Brennan was in charge of identifying, renditioning, and “terminating with extreme prejudice” anyone who could track 9/11 planning and implementation back to himself, the Saudi government, and the Israeli Mossad — a key intelligence partner of the House of Saud. But Brennan’s top mission was to ensure that a CIA asset, long groomed by Langley for the White House, was elected president in 2008. Barack Obama, who was schooled as a boy in Jakarta in the Muslim faith and whose Kenyan father was a Muslim, was the “chosen one.” Obama was propelled to the national stage after the political careers of a number of Illinois politicians — Blair Hull, Jack Ryan, and finally, Rod Blagojevich — were trashed in a series of CIA dirty tricks campaigns. From 2003 to 2004, Brennan was the chief of the CIA’s Terrorist Threat Integration Center. While there, and later, while Obama’s counter-terrorism chief, Brennan called the shots on CIA drone targets as the custodian of the “Disposition Matrix.” Systematically, any jihadist who could have blown the whistle on Brennan was summarily liquidated. As CIA director, Brennan continued to use the “Disposition Matrix” to terminate potential witnesses to his selling out to the Saudis. After Nigerian jihadist Umar Farouk Abdulmutallab — the infamous “underwear bomber” — tried to blow up Northwest Airlines Flight 253 during its final approach to Detroit International Airport from Amsterdam on Christmas Day 2009, Brennan said U.S. intelligence agencies “did not miss any signs” that could have prevented the attempt. Brennan, again, was lying in order to cover up the fact that U.S. intelligence agents had cleared the Nigerian to board the flight without a passport by claiming he was a Sudanese refugee traveling only with refugee documents. Abdulmutallab, known as “Farouk1986” on various Internet websites as a jihadist sympathizer, was already known to be a follower of American citizen and Al Qaeda operative Anwar al-Awlaki, a one-time consultant to the Department of Defense. On November 19, 2009, Abdulmutallab’s wealthy Nigerian banker father had informed the CIA station in Abuja, Nigeria that his son had “extreme religious views” and that he was in Yemen. Brennan ignored the intelligence from Abuja and gave the green light for the young Nigerian’s trip to Detroit. The underwear bomber incident gave Brennan the justification to order another drone strike. To clear the tracks away from Brennan back to Saudi Arabia and Al Qaeda, the CIA’s chief judge and executioner ordered a drone hit on al-Awlaki in Yemen on September 30, 2011, and his teenage son in Yemen two weeks later. These drone hits eliminated problems with two potential witnesses to Brennan’s treasonous activities. As far as Abdulmutallab is concerned, he is permanently incommunicado as a result of a four consecutive lifetime sentence at the federal Supermax prison in Florence, Colorado. To protect his Muslim identity, Brennan also set about to destroy troublesome opponents. Former FBI agent Guandolo was the first to receive Brennan’s thuggish treatment. Information was leaked that Guandolo had, during 2005, maintained an intimate relationship with a confidential source, Lori Mody, in the federal prosecution of Louisiana U.S. Representative William Jefferson. Although trial judge T.S. Ellis III ruled the affair irrelevant to the case against Jefferson, Guandolo was forced to quit the FBI after the leak about his past sexual affairs somehow landed on the FBI director’s office from Guandolo’s therapist’s office. Guandolo resigned from the FBI in 2009 amid a furor over his extramarital affair with Mody. “THE WEST, GULF COUNTRIES, AND TURKEY [WHO] SUPPORT THE [SYRIAN] OPPOSITION… THERE IS THE POSSIBILITY OF ESTABLISHING A DECLARED OR UNDECLARED SALAFIST PRINCIPALITY IN EASTERN SYRIA (HASAKA AND DER ZOR), AND THIS IS EXACTLY WHAT THE SUPPORTING POWERS TO THE OPPOSITION WANT, IN ORDER TO ISOLATE THE SYRIAN REGIME…”. Brennan began circulating rumors to Washington officialdom that Flynn was guilty of developing his own facts, dubbed “Flynn facts,” in intelligence reports. Brennan’s goal was to discredit Flynn’s and the DIA’s intelligence pinning support for ISIL and other jihadists on the CIA. A tip from Flynn’s predecessor, Vincent Stewart, to former Secretary of State Colin Powell intimated that Flynn was “abusive with staff, didn’t listen, worked against policy, bad management, etc.” It was information that Brennan used to convince Obama to send Flynn packing. It was no coincidence that Guandolo and Flynn both ended up being described as hate mongers by the Zionist-run Southern Poverty Law Center, an Orwellian “Ministry of Truth” designed to stifle free speech in the United States and an organization that has served the interests of the CIA. The recent assassination of Russian ambassador to Turkey Andrey Karlov by an off-duty Turkish anti-riot police officer, who casually strolled into an art exhibit in Ankara, bears the markings of Brennan’s “Disposition Matrix.” Karlov served in Ankara since 2013 and his posting overlapped with Flynn’s term as DIA chief. It is known that Flynn, like Trump, sees Russia as an invaluable ally against the Islamic State and its major allies, Saudi Arabia and Turkey. Brennan and his friends inside the Turkish dictatorship of Recep Tayyip Erdogan are trying to spin the story that the Islamist police assassin of Karlov, Mevlüt Mert Altıntaş, worked for the Fethulleh Gulen organization. Gulen is a moderate Muslim businessman-cleric living in exile in Pennsylvania who has been a fierce critic of the Islamic State and Erdogan’s alliance with it in Syria. Although a past CIA asset, Gulen would have no interest in ordering a hit on the Russian ambassador. As a Saudi intelligence mole, Brennan does have a keen interest in the killing of Karlov. By assassinating Karlov, Brennan has driven a wedge in an emerging Russian-Turkish agreement to consolidate Assad’s control of Aleppo and bring about the end of Brennan’s jihadist army in Syria. “intentionally” aided terrorists and has committed treason. It is clear that Guandolo saw FBI raw intelligence on Brennan that would lead anyone to conclude that the Saudis and their Wahhabist imams have benefited from a major mole inside the CIA for at least two decades. And there is no telling what Flynn was able to gather on Brennan, especially while enjoying “all-source” intelligence access to signals intelligence intercepts from the National Security Agency, FBI field agents’ reports, and even CIA counter-intelligence reports on suspected moles within Langley. There is one thing for certain, Brennan is already destroying incriminating documents at CIA headquarters that could land him in prison for a very long time.